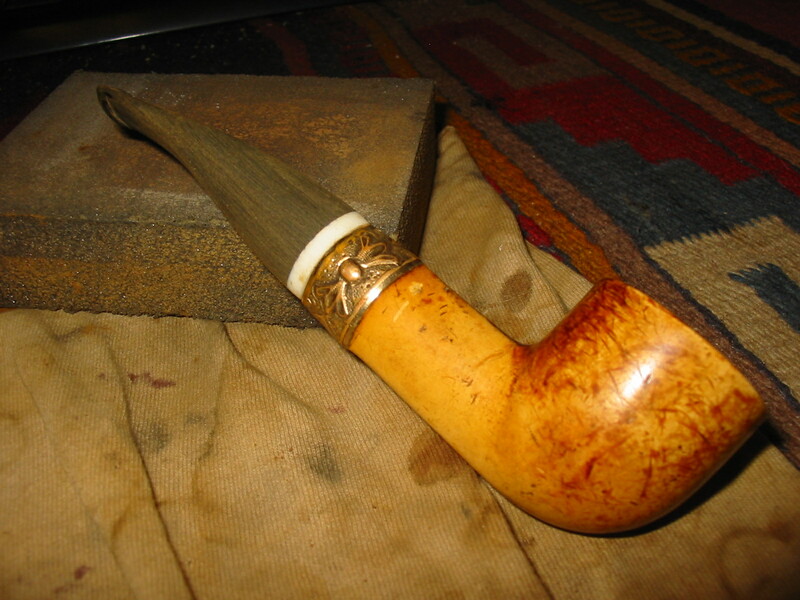 I saw this old Meerschaum pipe bowl on Ebay and decided to put a low bid on it. I was not surprised to have won it and paid for it quickly. The seller packed it very well and shipped it off to Vancouver, Canada. Below are the Ebay photos that caught my attention. 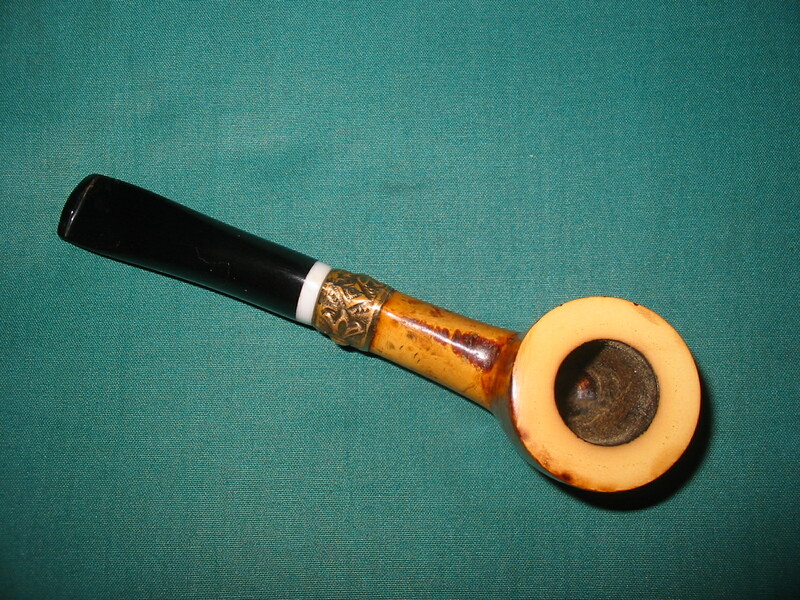 I think the thing that intrigued me the most was the vertical oval shank on the pipe. 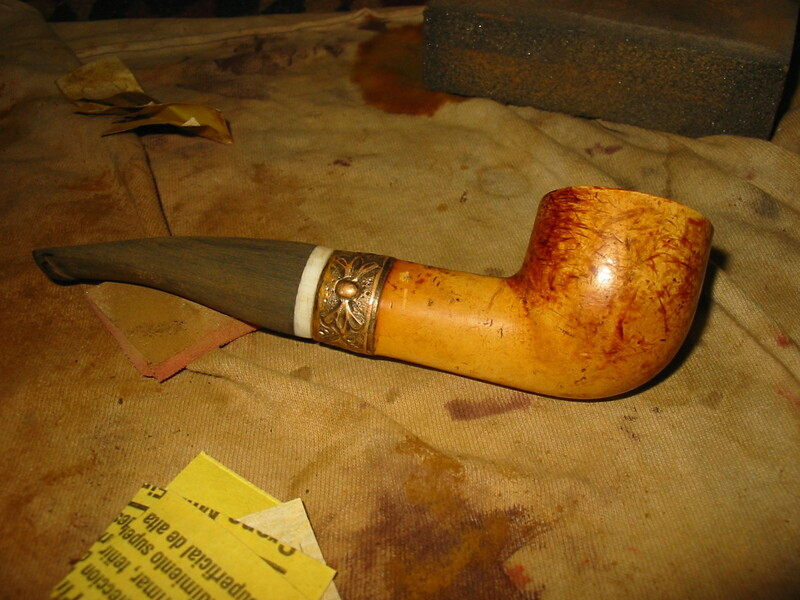 To restem that pipe would be a great challenge – find a stem large enough to work with and shape it until it fit. 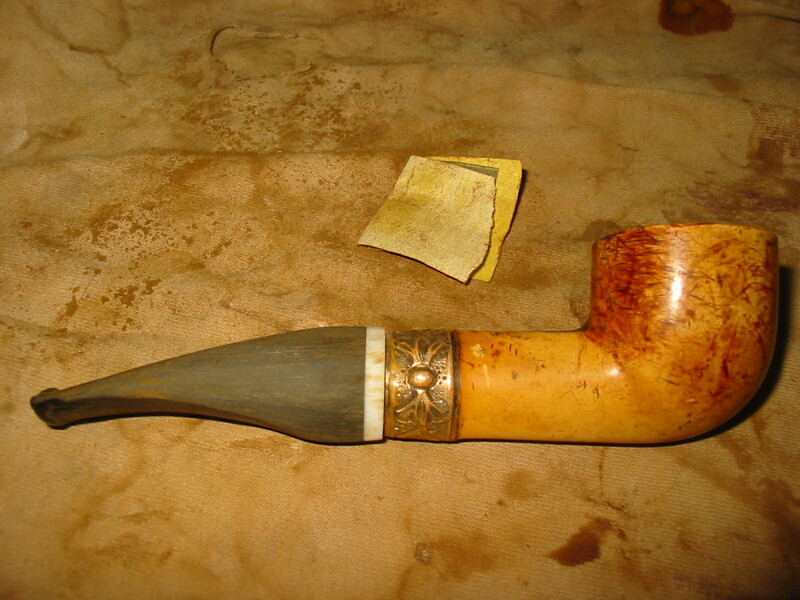 I thought I had just the stem in my box – a gift from a friend on Pipesmokers Unleashed Forum, Robert. From the photos it looked to be in rough shape. 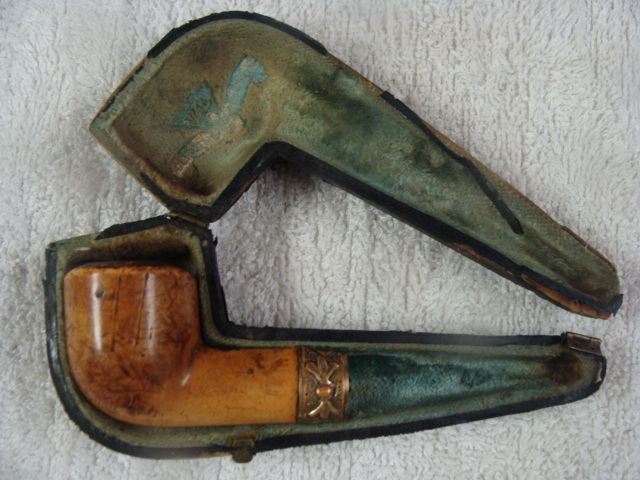 The pipe case said it was a WDC but I have no way of knowing if that is true. 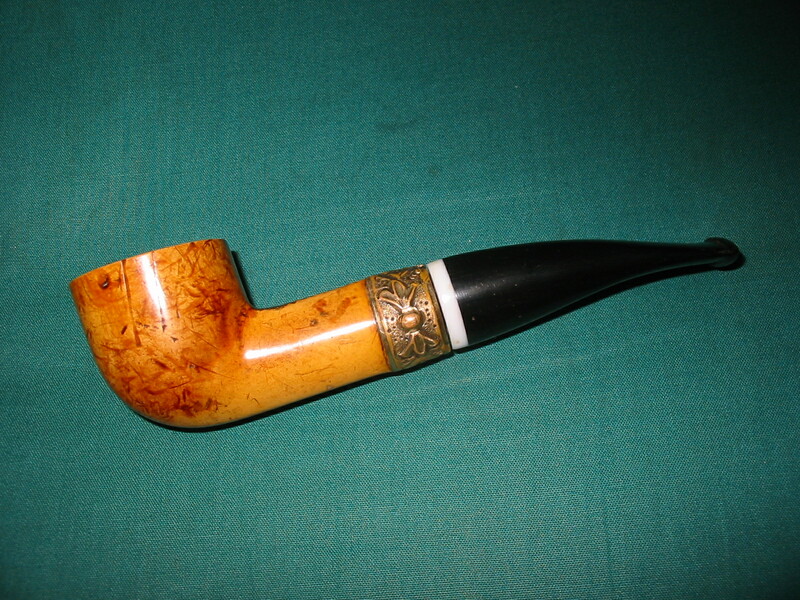 The gold filigree on the band looks like the old WDC pipes of the late 1890s but I am still uncertain as to the maker. It was in rough shape as can be seen from the photos. 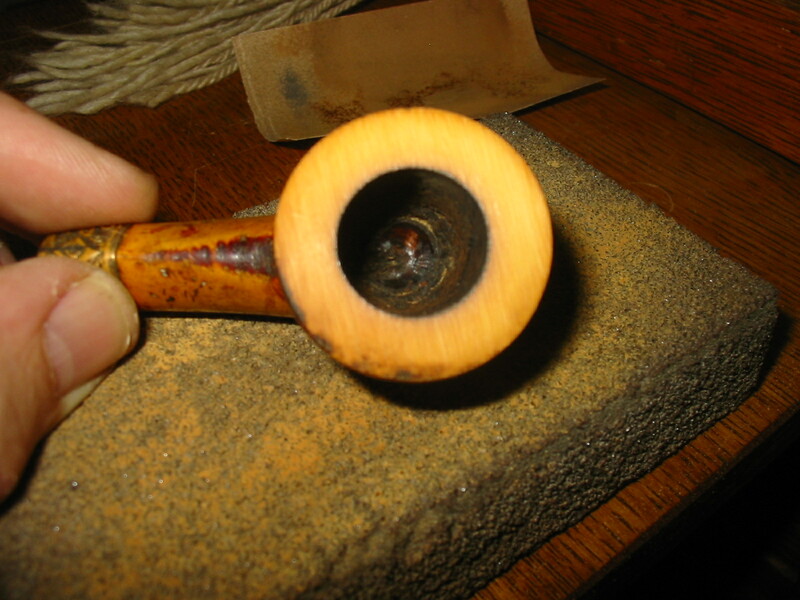 There were many scratches and gouges around the outside of the bowl. 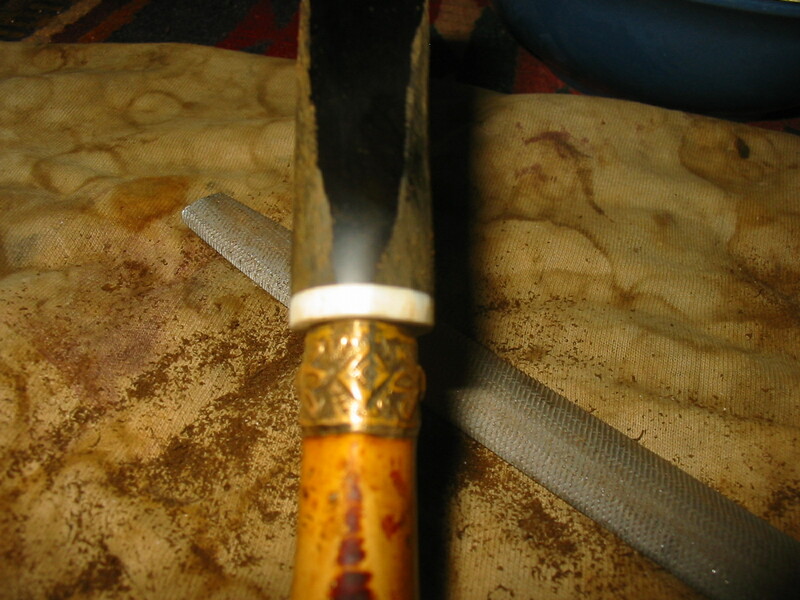 The shank had marks on the top that looked like someone had taken a file to it. The rim was probably the worst. 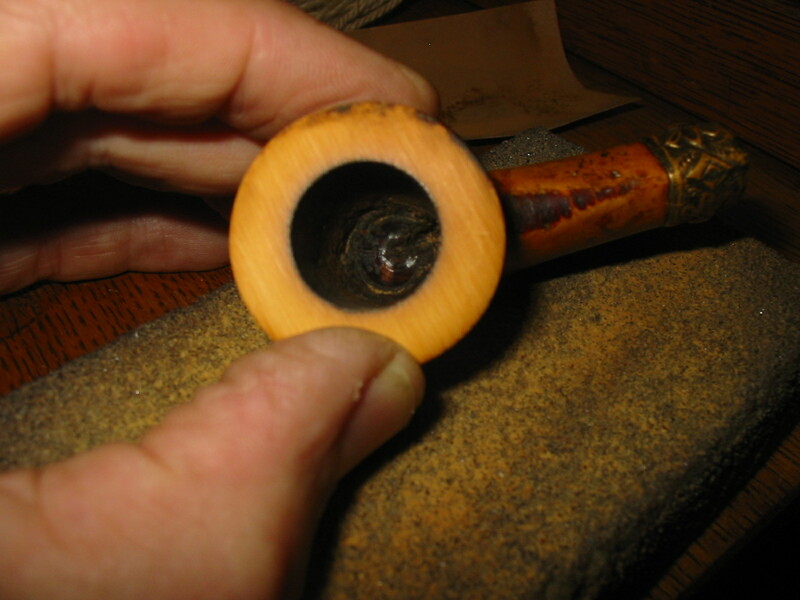 With the rough edges on the back right side of the bowl the rim/top appeared to be angled to the right side and worn down. The tar build up was heavy in the bowl and on the rim. 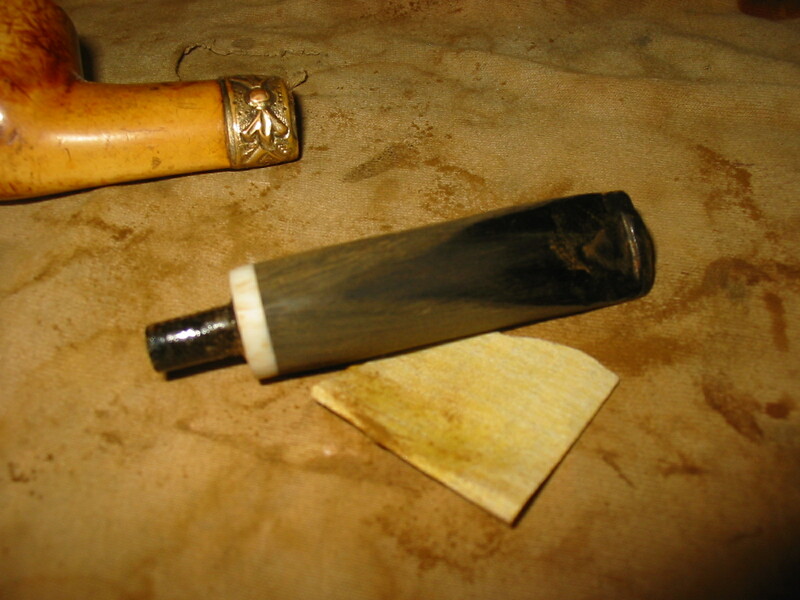 The tenon was broken off in the shank. 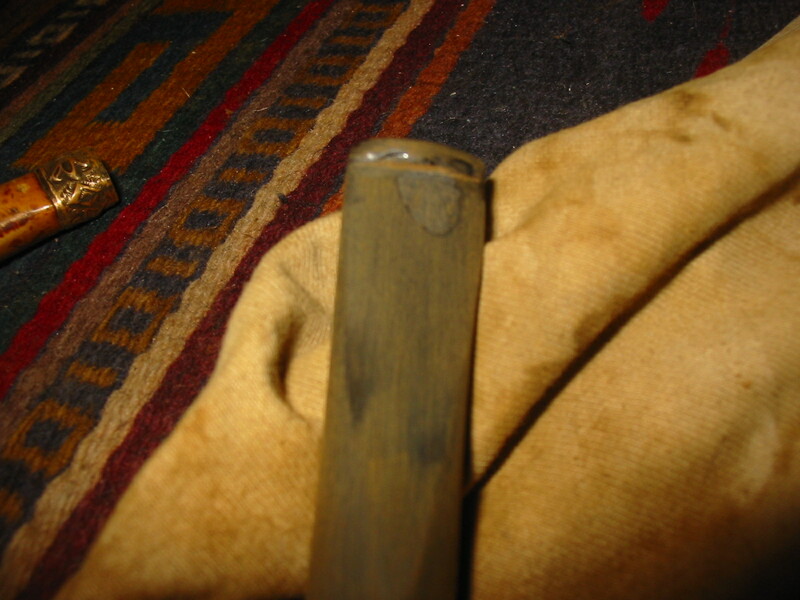 It appeared to be an old bone tenon and a bone insert in the mortise that was threaded to take the screw in tenon. 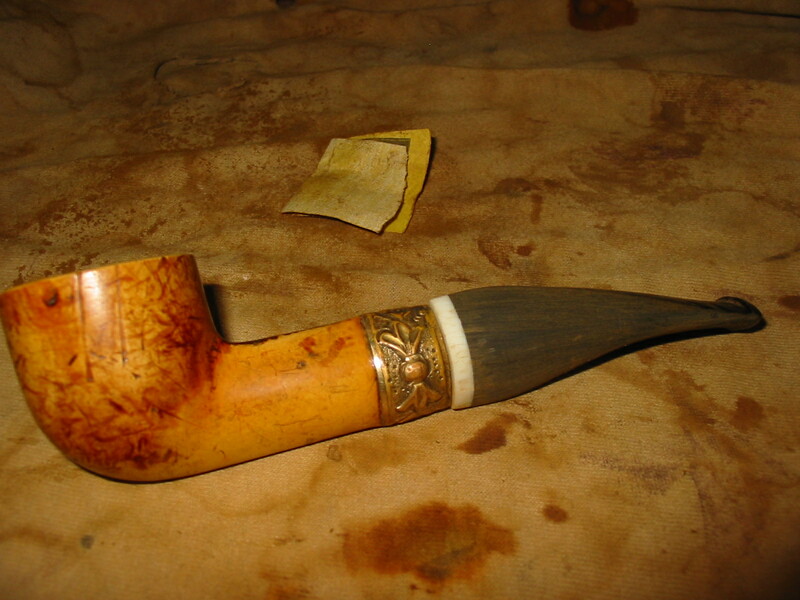 I am assuming the pipe probably had an amber stem in its first appearance in the shop but that was long since broken and lost. 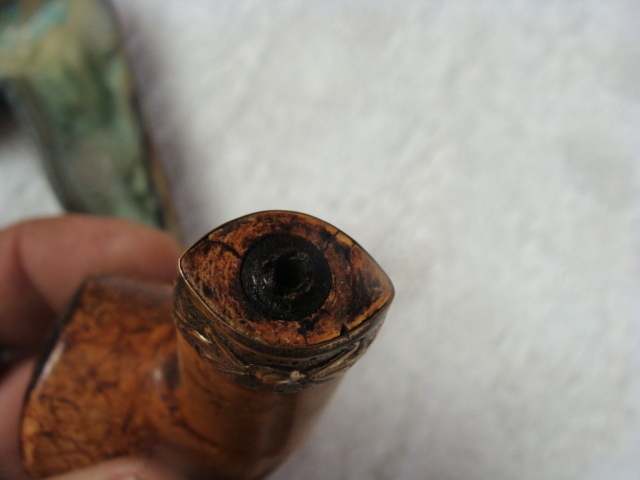 The WDC case was also very rough – the edges were worn away, the wood broken and a hinge dangling unused. The inside was badly stained. Yesterday afternoon I came home from work early and found a package awaiting me – I knew that the meer had arrived. I had to laugh when I cut open the box – it had a previous label a Funeral Home in Ohio. 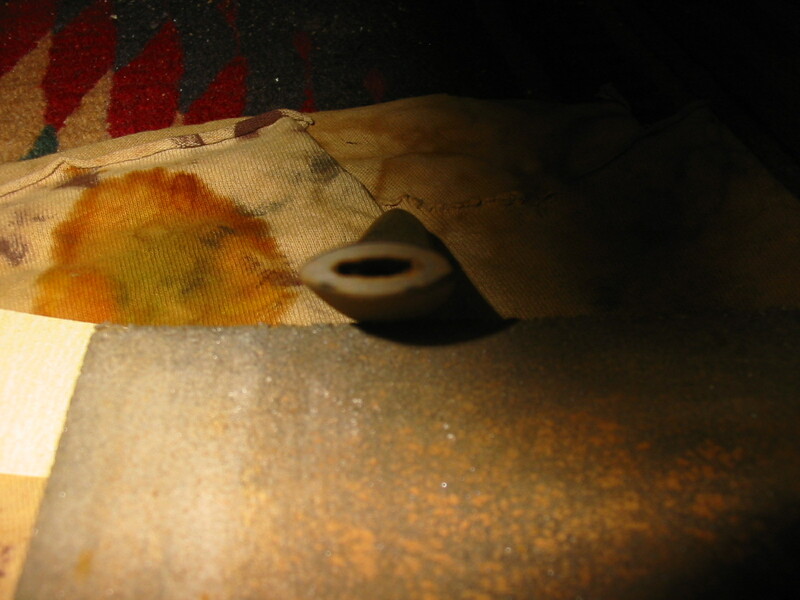 I don’t know if that was a commentary on the pipe bowl that resided inside the box or if a funny coincidence. I cut the tape and opened the box. 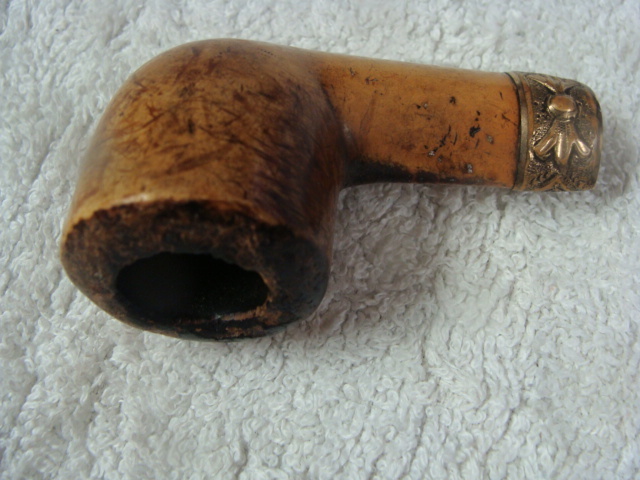 The pipe inside was both in worse shape than I had imagined from the seller’s excellent pictures and in better shape. 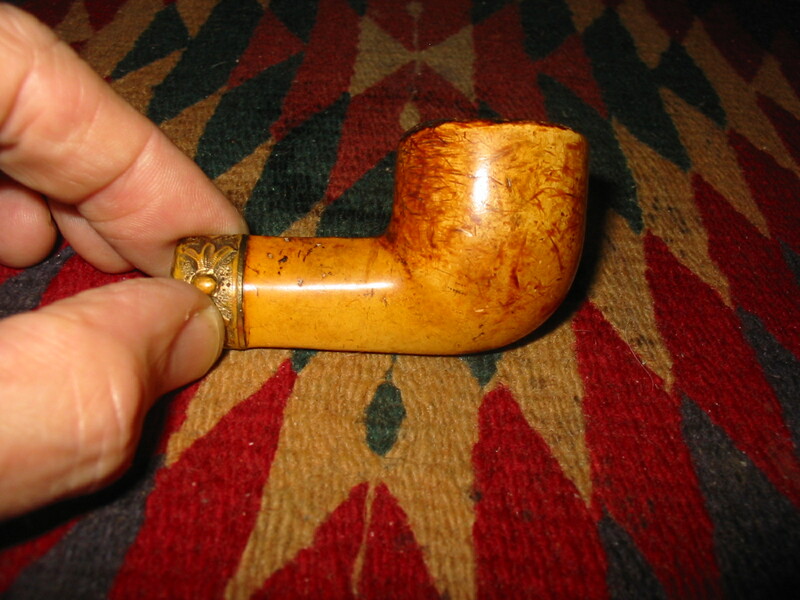 The meer under the band was cracked as can be seen in the photo above and that was as it was when it arrived. 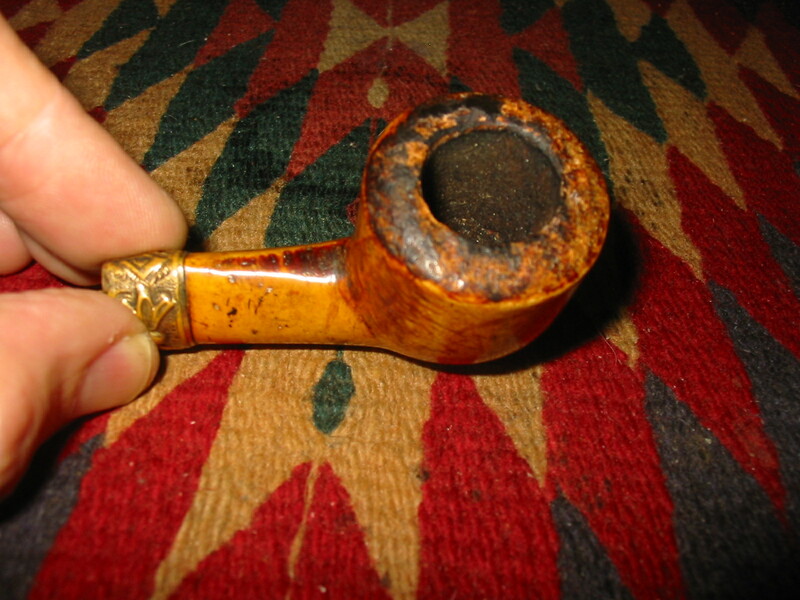 The scratches in the surface of the bowl were not as deep as they appeared in the photos and the pipe when place on the rim on a flat board was actually not slanted to the right – the damage to the outer edges of the right back side made it appear worse than it actually was in reality. The next photos show the pipe on the work table just out of the box. 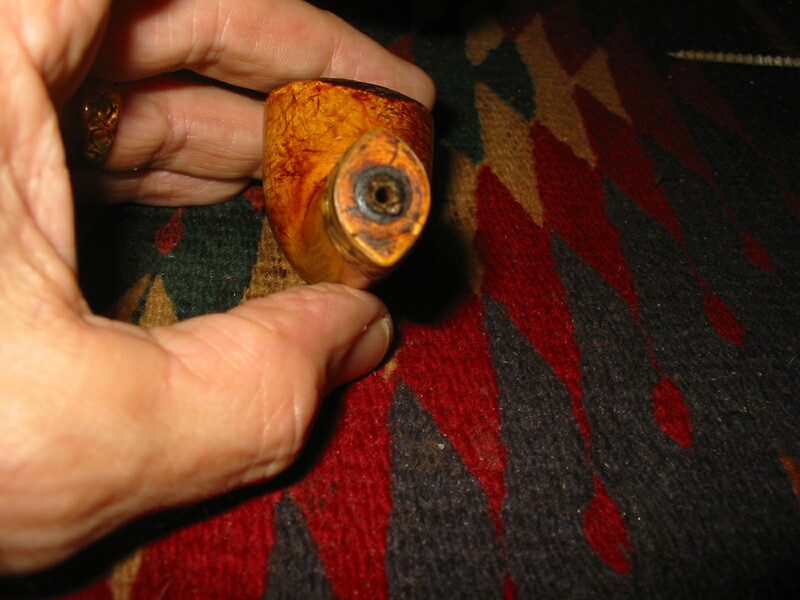 After examining it carefully with my lens and a dental pick I decided to begin the clean up by trying to remove the tenon. I used the screw that I generally use to remove a tenon to no avail. 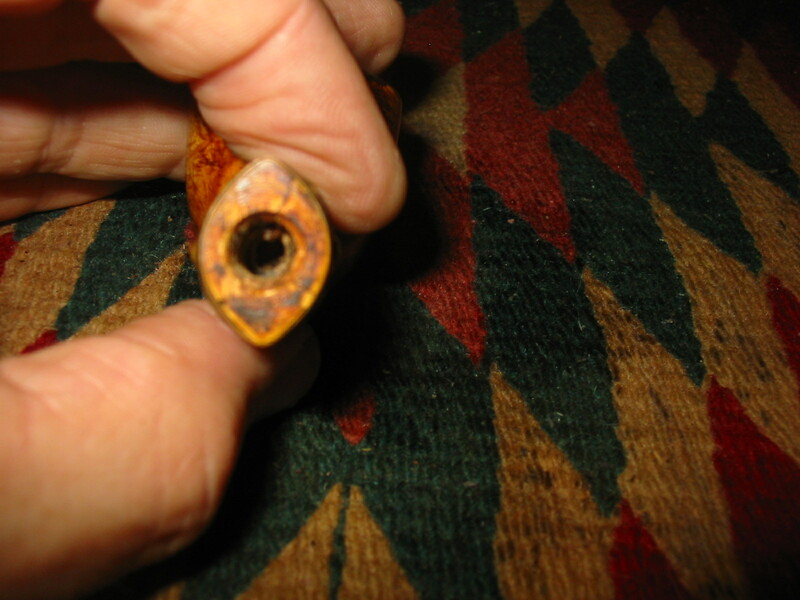 The threads in the mortise were locked tight around the tenon. I picked at it with the dental pick and was unable to remove it that way either. I decided to drill out the old tenon. So I set up a cordless drill with a drill bit slightly larger than the airway in the broken tenon. I slowly drilled the airway with the bit and exchanged it for increasingly larger bits until I had the airway cleared of the debris. 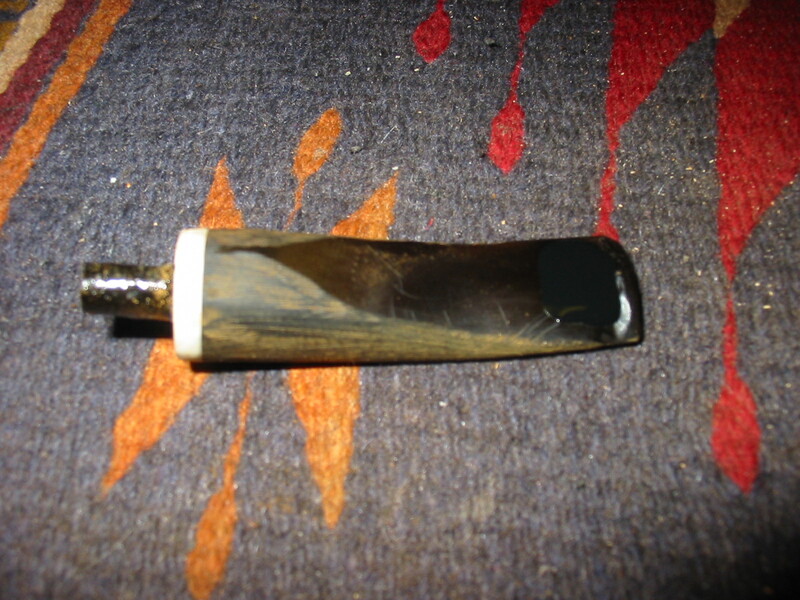 I then used a ¼ inch bit to open the mortise and clear out the remaining debris of the mortise and tenon. The second photo below shows the mortise after I opened it up. I used a dental pick to clean out the remaining pieces and hand turned the quarter-inch drill bit into the mortise to smooth out the walls of the airway and open it to receive a new tenon. 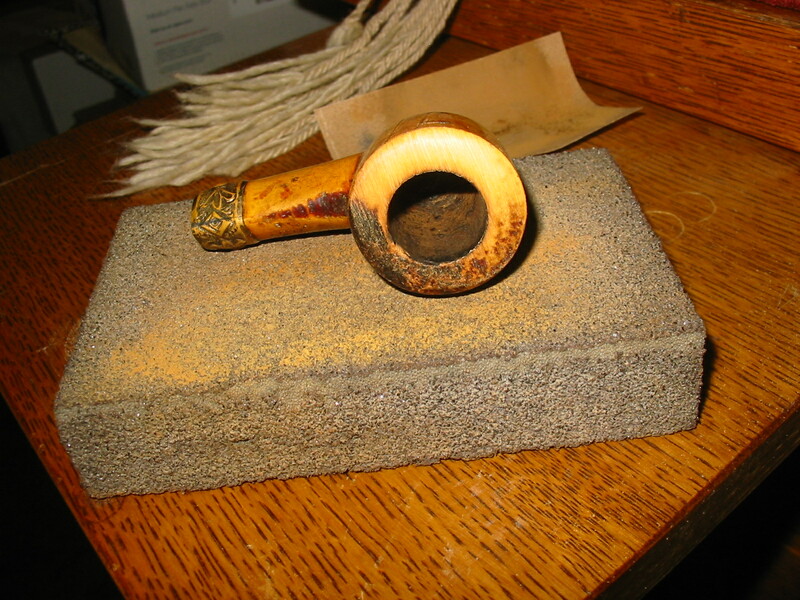 I took the pipe bowl back to the work table and set up a coarse sanding block on my worktable to top the bowl of the meer. 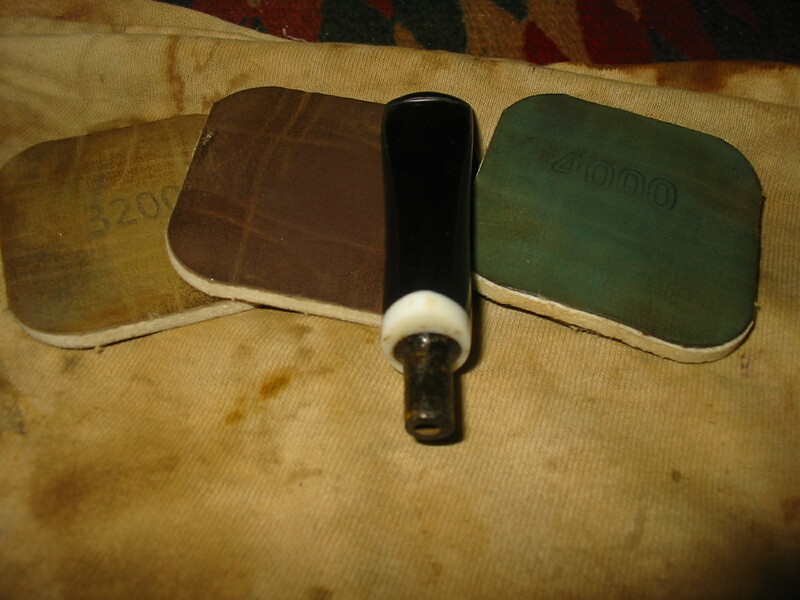 I have used this block in the past with good success on the softer meerschaum material. 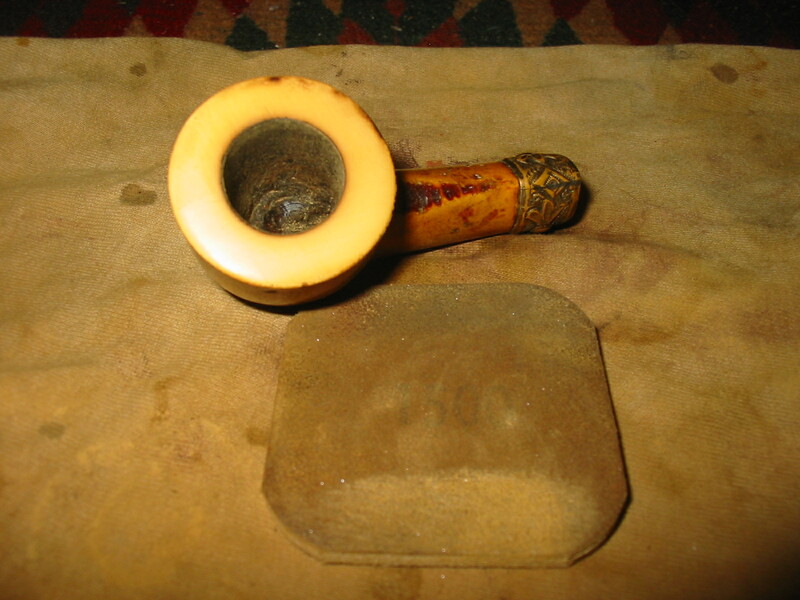 I placed the bowl, rim down on the surface of the block and sanded it in a clockwise direction (no reason for that other than I am right-handed). I sanded it, checking often to see how the rim was cleaning up until the surface was clear and the top of the bowl once again level. Surprisingly I did not have to remove too much material from the rim to clean up the surface. When I had finished the sanding, I used micromesh sanding pads to sand the top smooth once again and remove the scratches from the coarse sanding block. 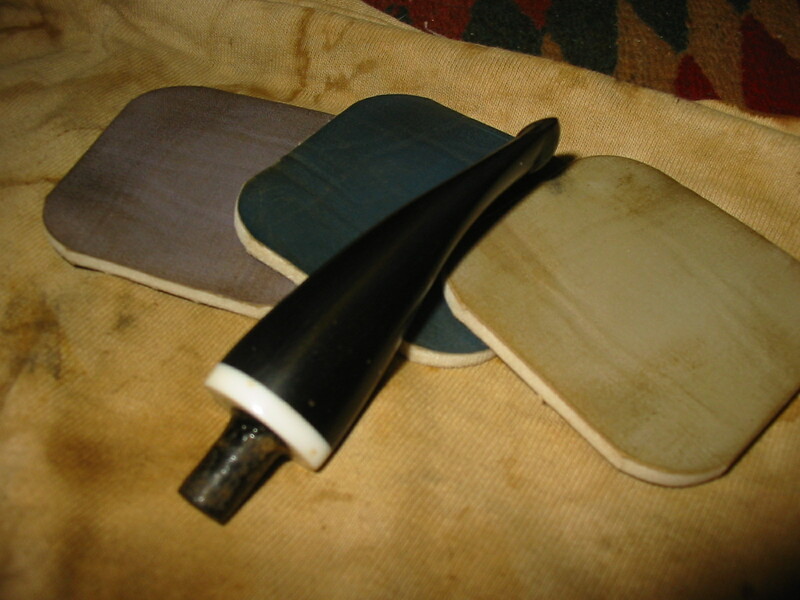 The micromesh sanding pads from 1500 – 12,000 grit bring a shine back to the surface of the meer and prepare it for rewaxing once the pipe is finished. 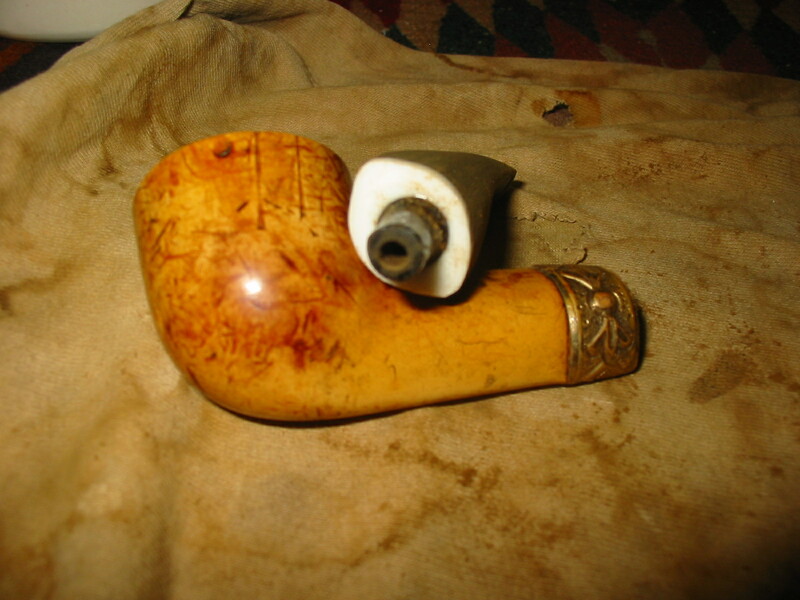 At this point in the process I decided to see if I could fit a new stem on the pipe. 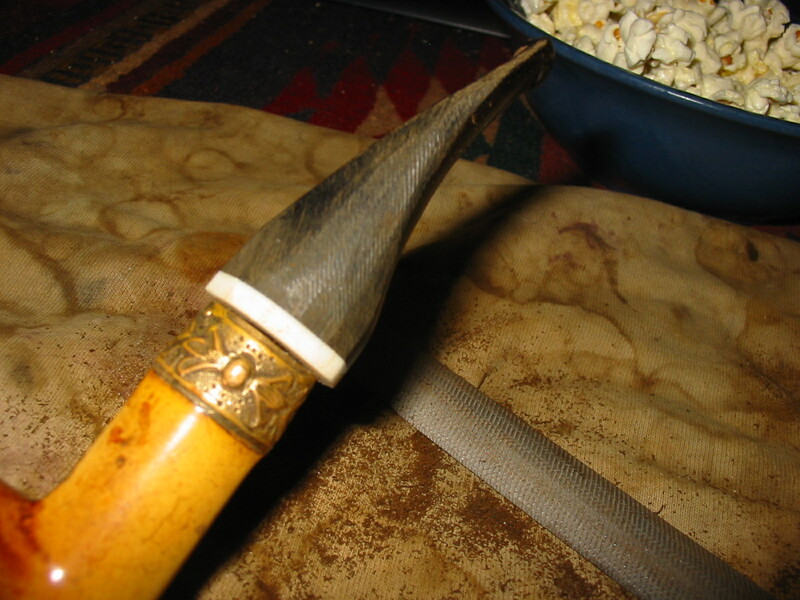 The diameter of the oval shank was quite large and would require a large diameter round stem. 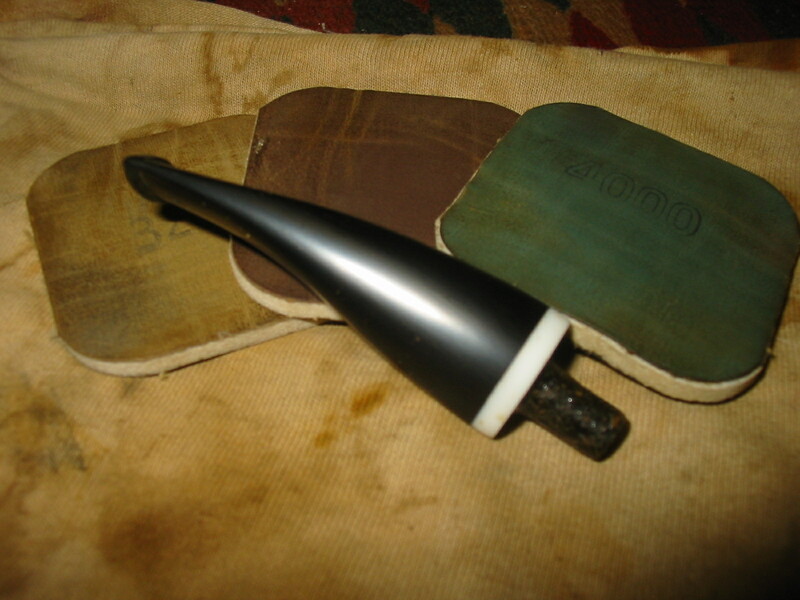 To make it an oval stem would require that much of the existing vulcanite of the stem would have to be removed in the shaping process. 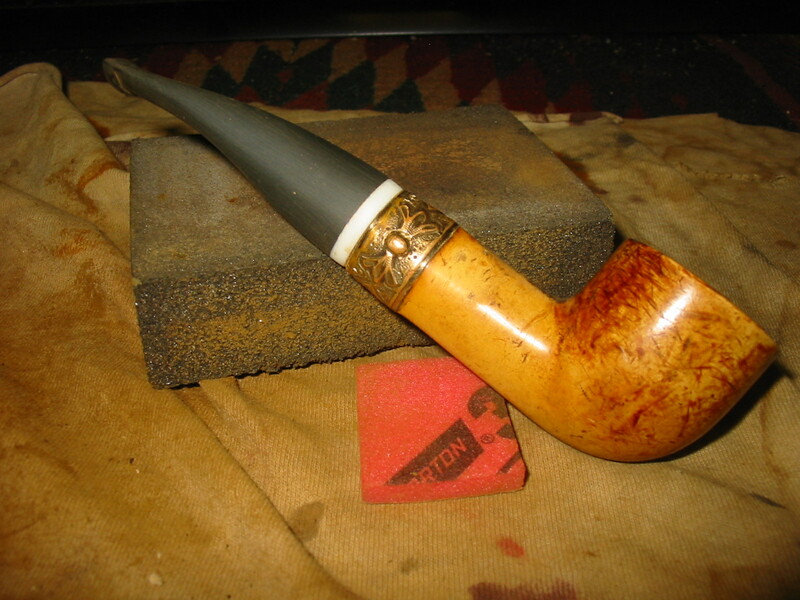 I had an old Brebbia stem that a friend on Pipe Smoker Unleashed Forum sent me for an old Peterson that I was restemming. 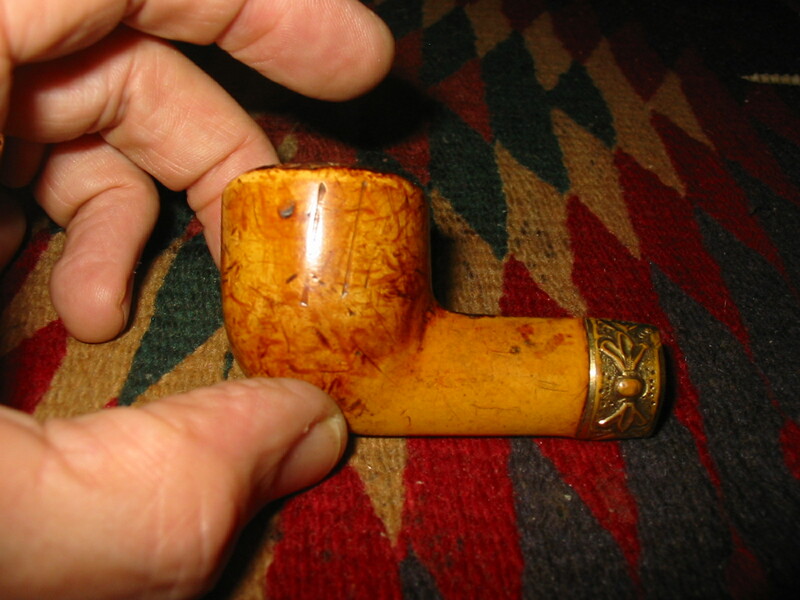 The tenon was too small for the Pete but too large for the old meer. 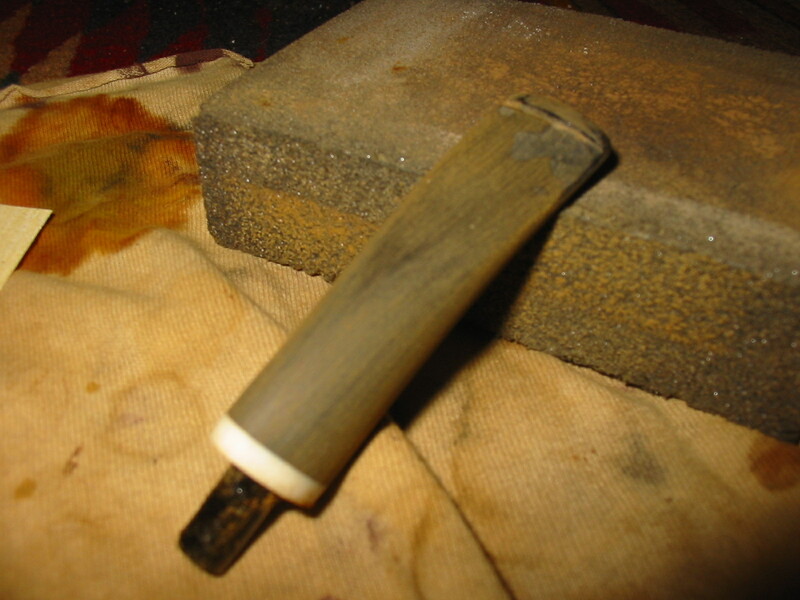 I used a Dremel with a sanding drum to remove the excess material from the tenon until the fit was very close. 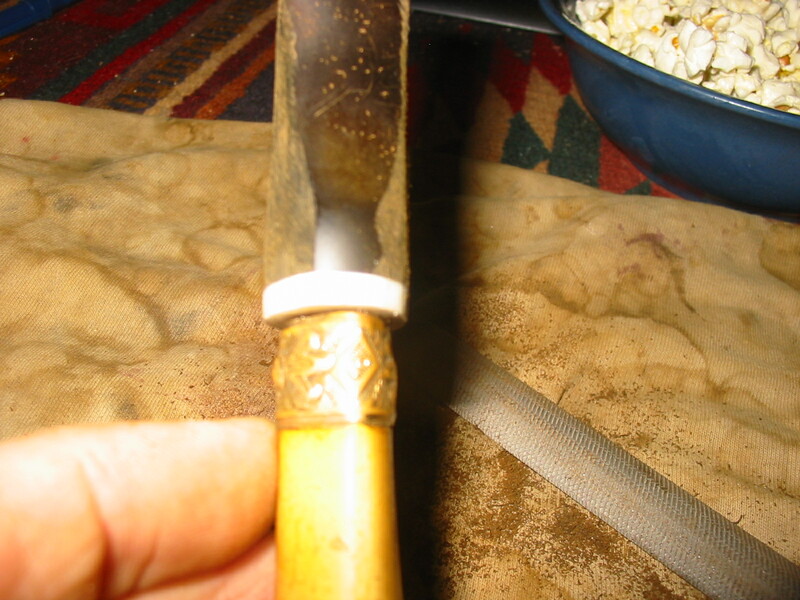 The remainder of the fitting was done with a wood rasp and sandpaper. 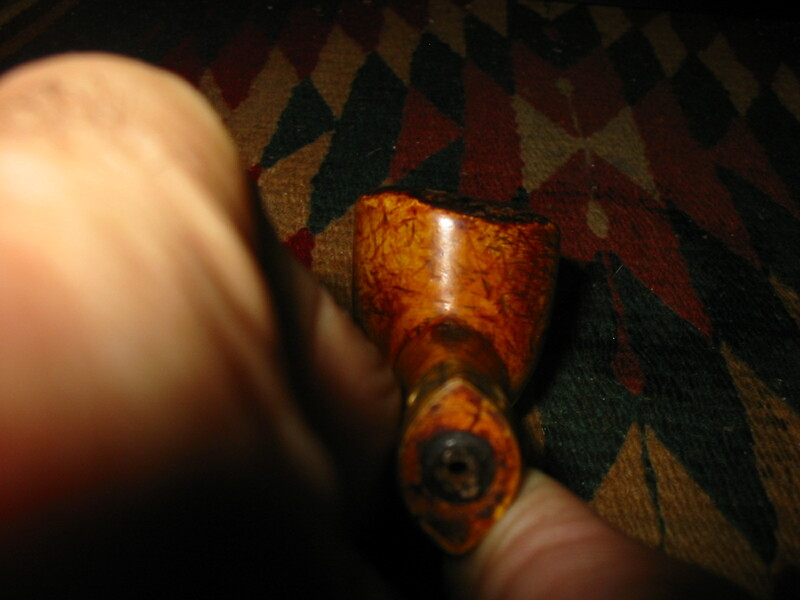 Once the tenon was finished I pushed the stem into the old meer to check on the fit of the tenon in the newly opened mortise. As can be seen in the photo below, the fit was perfect. 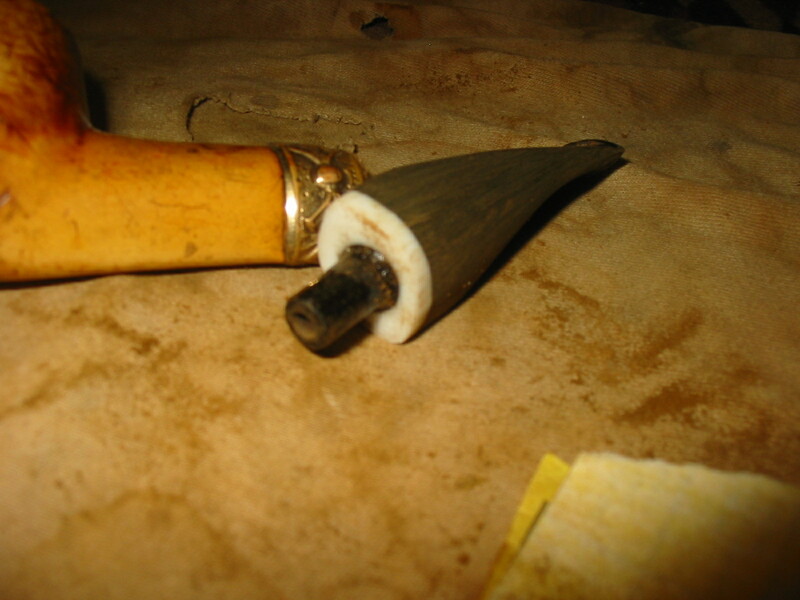 You can also see from that photo how much work would need to be done to fit the stem to match the shank of the pipe. The stem had deep bite marks on the top and the bottom near the button. They did not break the surface of the vulcanite. I decided to heat the surface of the stem with a heat gun and try to lift the dents from both sides as much as possible. 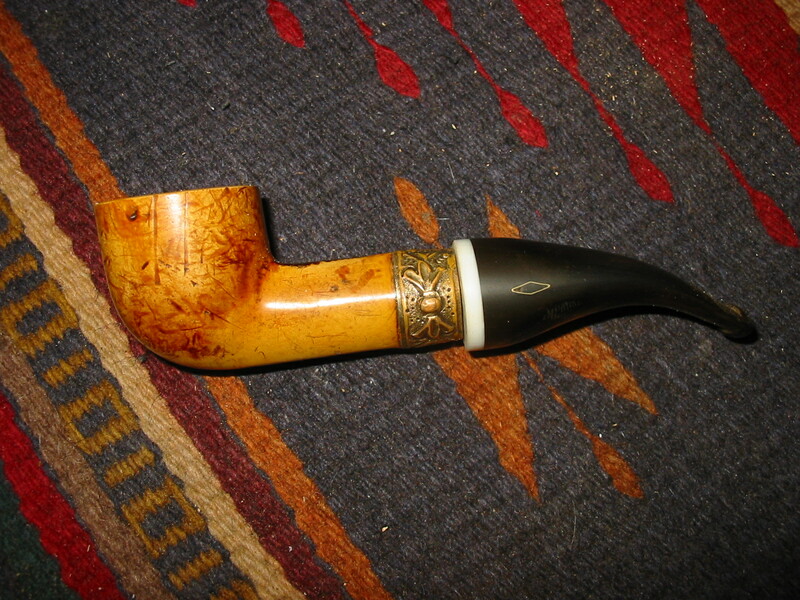 I also wanted to straighten the stem significantly to give a better profile to the pipe. The heat gun worked to achieve both aims. 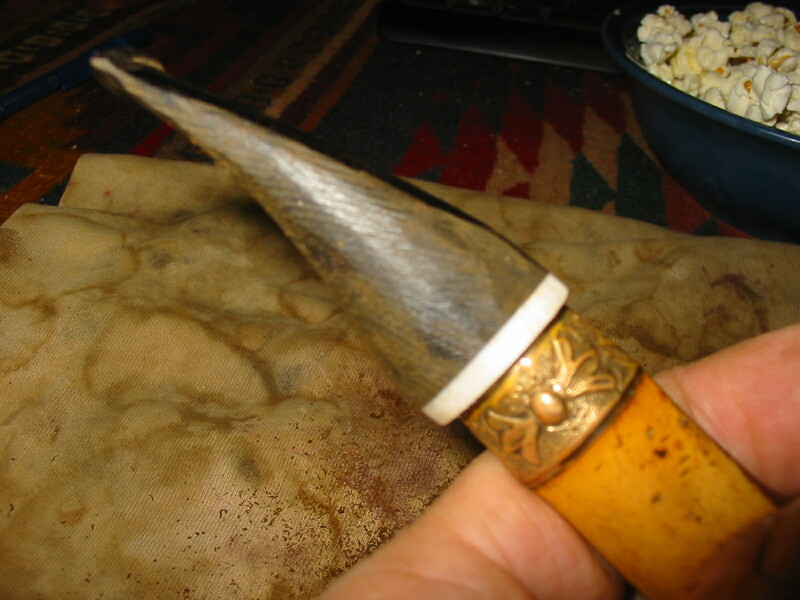 The tooth marks lifted quite a bit and would have to be filled with black superglue to finish the work and the bend straightened to the angle I wanted for the new stem. 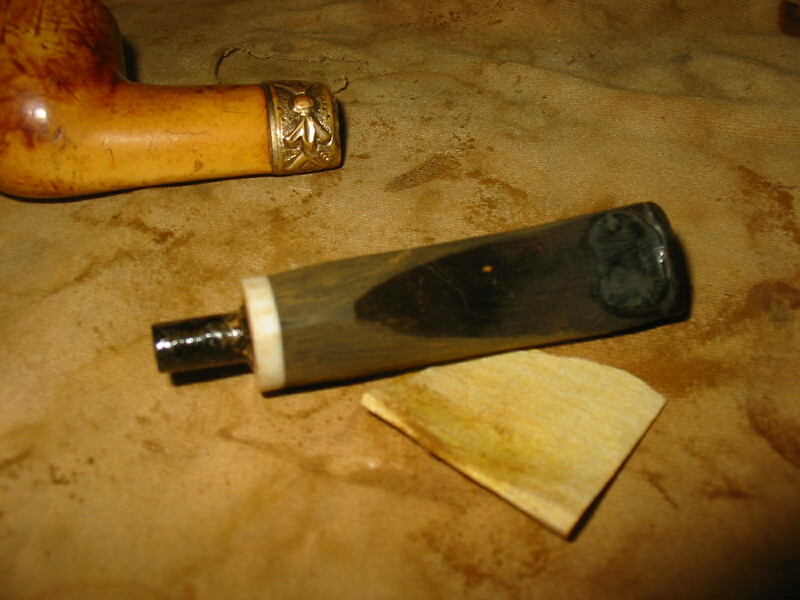 I removed the stem from the shank and cleaned up the tooth dents so that I could fill them with black superglue. 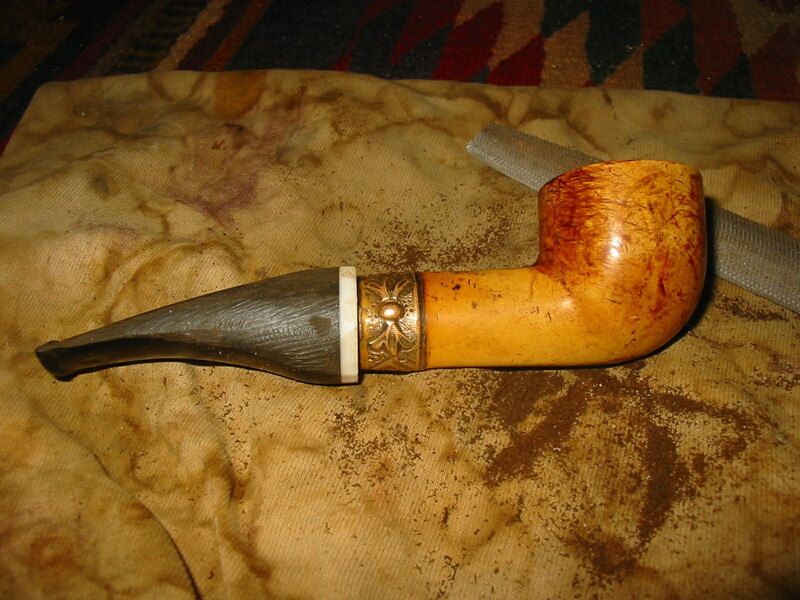 The glue takes quite a bit of time to cure so I waited until I was finished for the evening and then filled the dents and set the stem aside to cure over night. This morning I sanded the stem with 220 grit sandpaper and also sanded the superglue patch on the underside of the stem. The next four photos show the stem as it begins to take shape and the repaired spot on the underside of the stem. The oval is coming along nicely but there was still a lot of excess material that still needed to be removed. 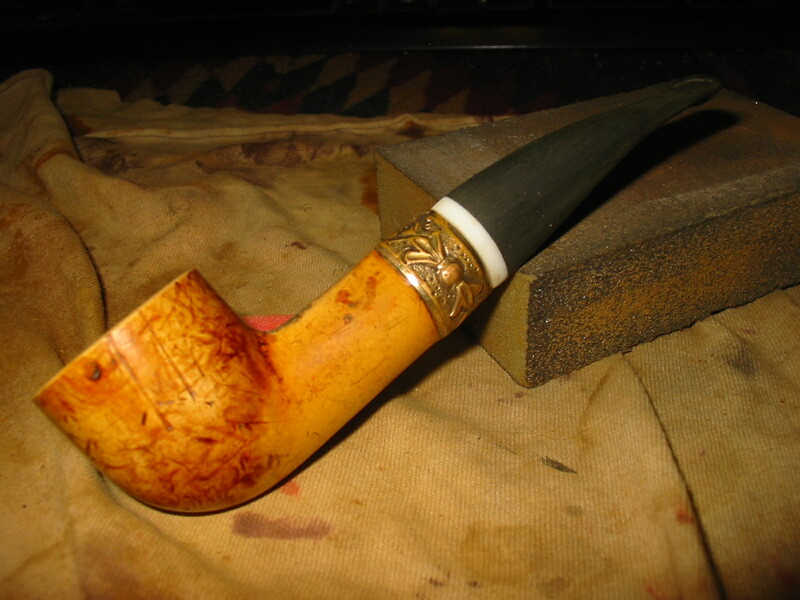 I continued to sand the stem to further tune the shape of the oval to match the shank. 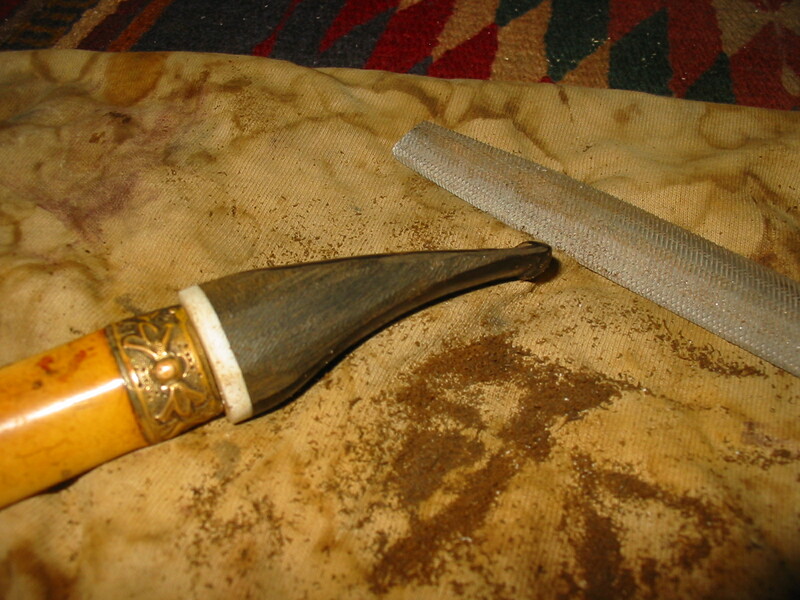 I used 220 grit sandpaper to remove the excess and shape the stem. 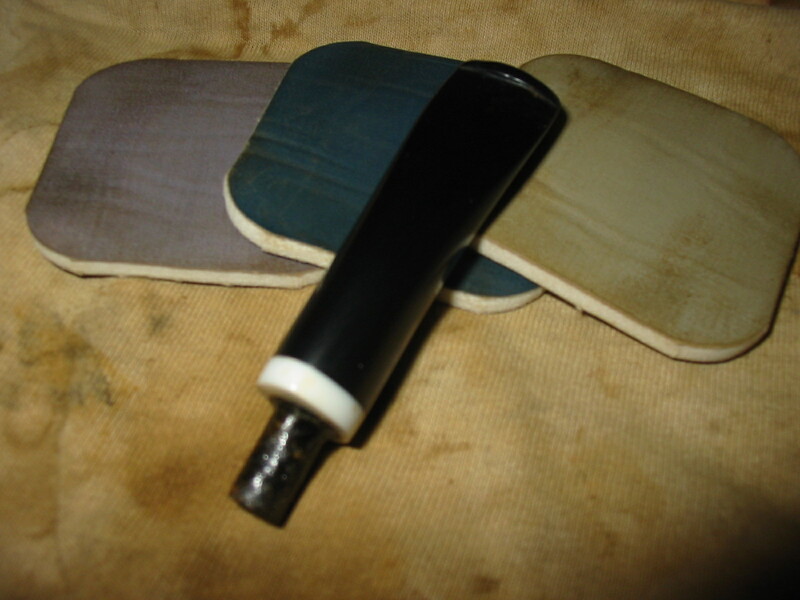 I worked on the superglue patch on the underside of the stem with the 220 grit sandpaper as well. In the next series of three photos you can see the shape I am aiming for with this stem. You can also see the size of the patch on the stem. The patch is still larger than the marks it covers so more sanding will need to be done on it to blend it into the vulcanite. I cleaned up the bite marks on the top of the stem and applied the black superglue patch to that surface as well. I set it aside while I worked on the bowl. 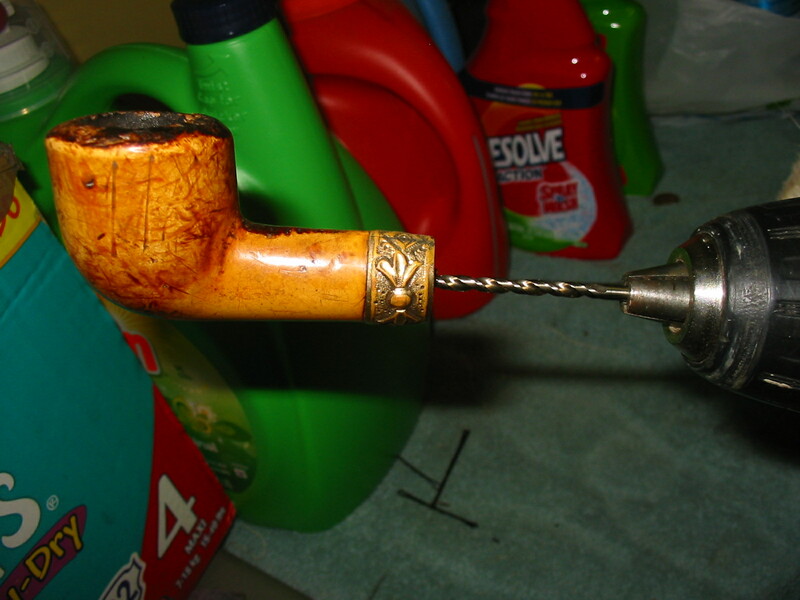 I wiped the bowl down with Murphy’s Oil Soap on a cotton pad to clean off the grime on the surface while leaving as much of the old patina as possible. 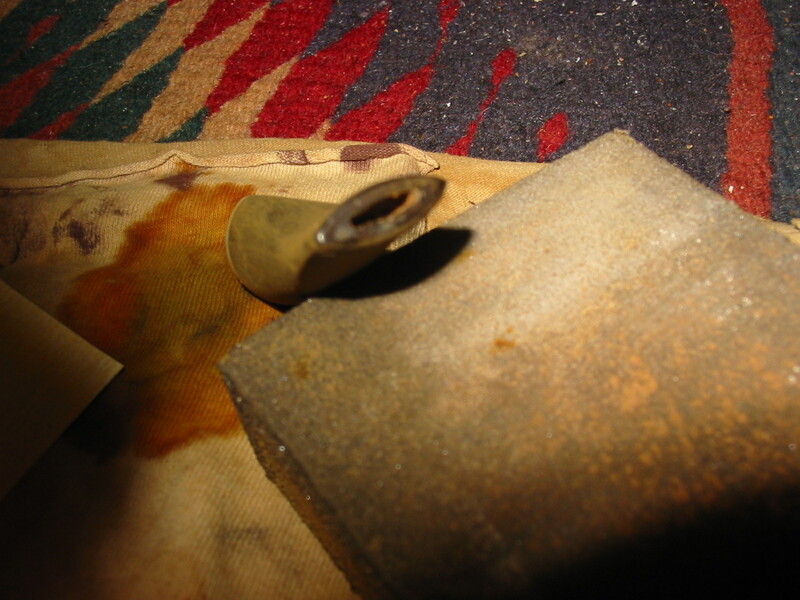 The first photo below shows the superglue patch. 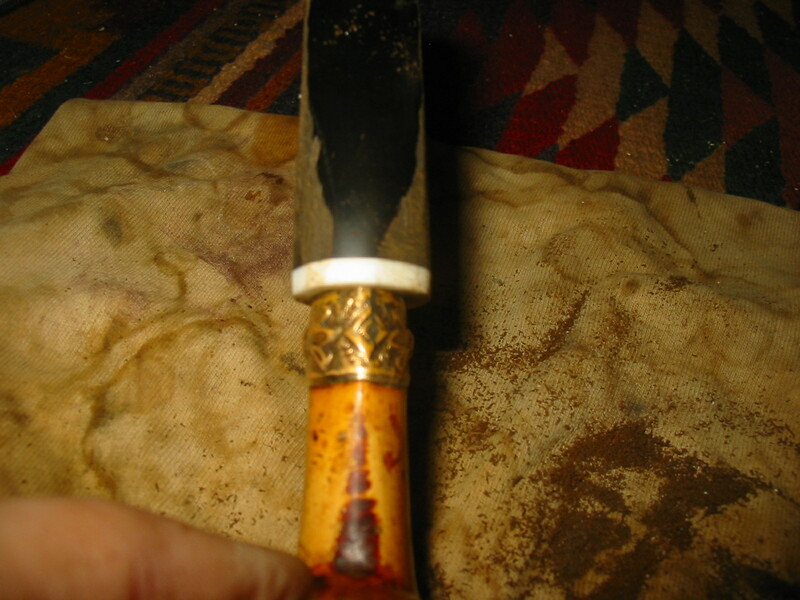 I applied it and used a dental pick to push it around the surface and also build up a few tooth marks on the edge of the button. 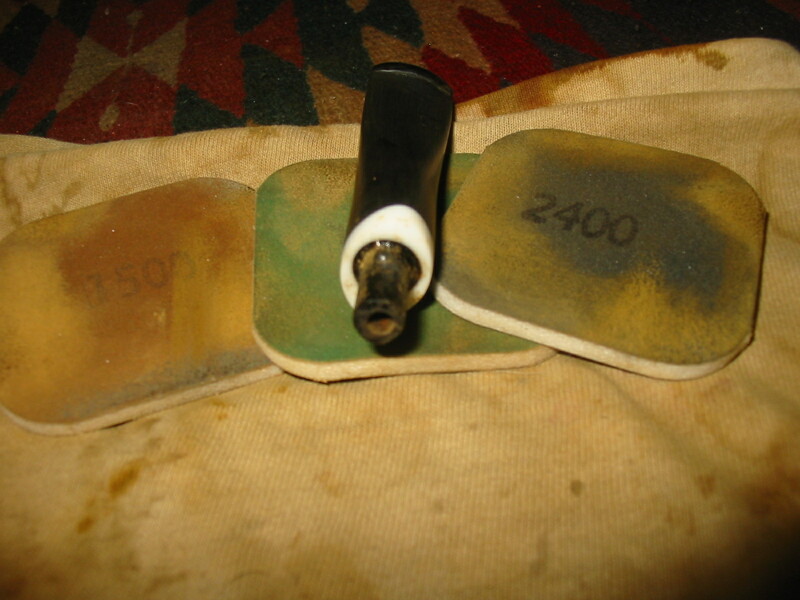 The second photo below shows the patch after it had dried and I had sanded the patch with 220 grit sandpaper. While working on the stem I decided to open the button to make it simpler to insert a pipe cleaner. I used needle files to make the slot larger. The second photo shows the opened slot in the button. 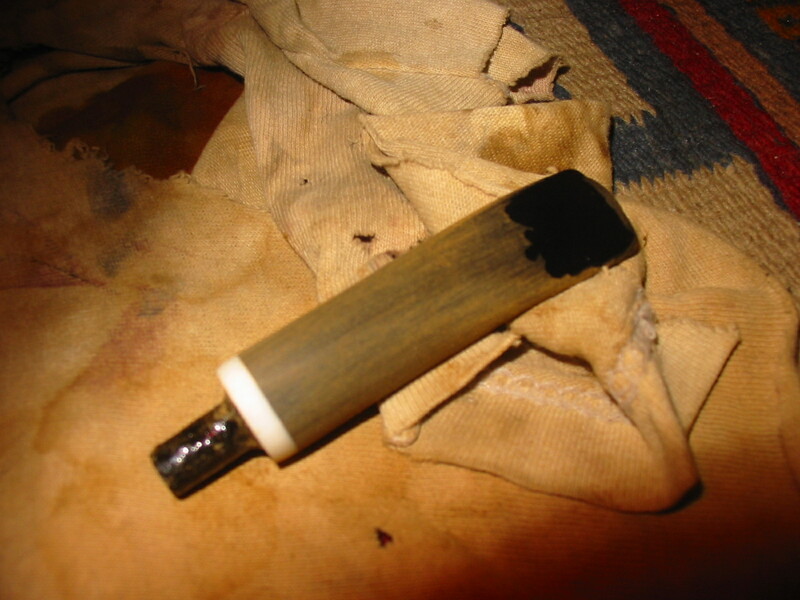 I sanded the inside of the slot with a folded piece of sandpaper to smooth the surface and polish the slot. 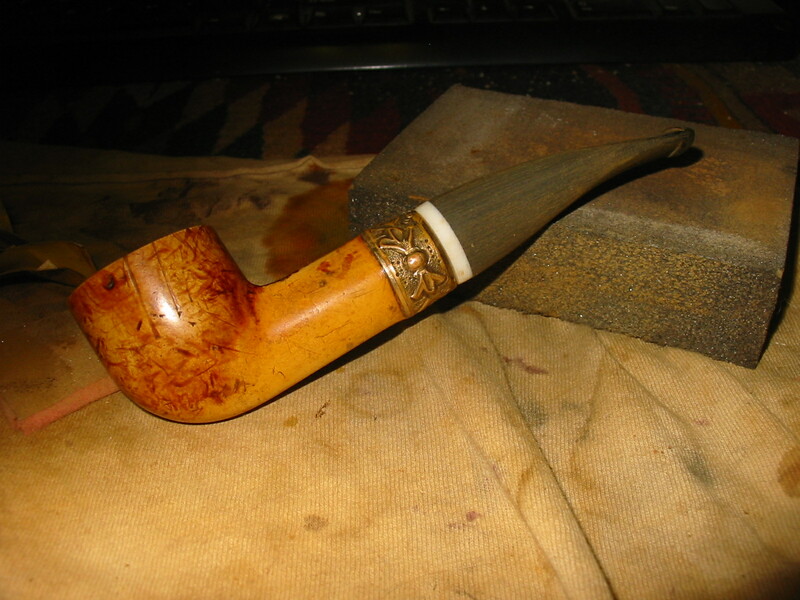 I took the pipe back to the Dremel and sanding drum to remove more of the excess vulcanite. 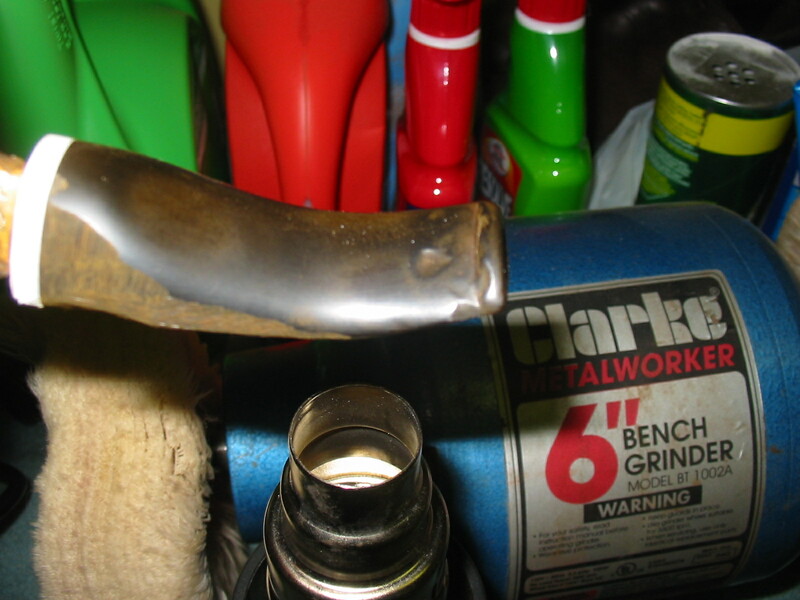 I had the basic shape in hand and just wanted to get it closer to the size of the shank before doing the finish sanding. I brought it back to the work table and sanded with 220 grit sandpaper until the fit was right. The next four photos show the progress in the fitting of the stem. 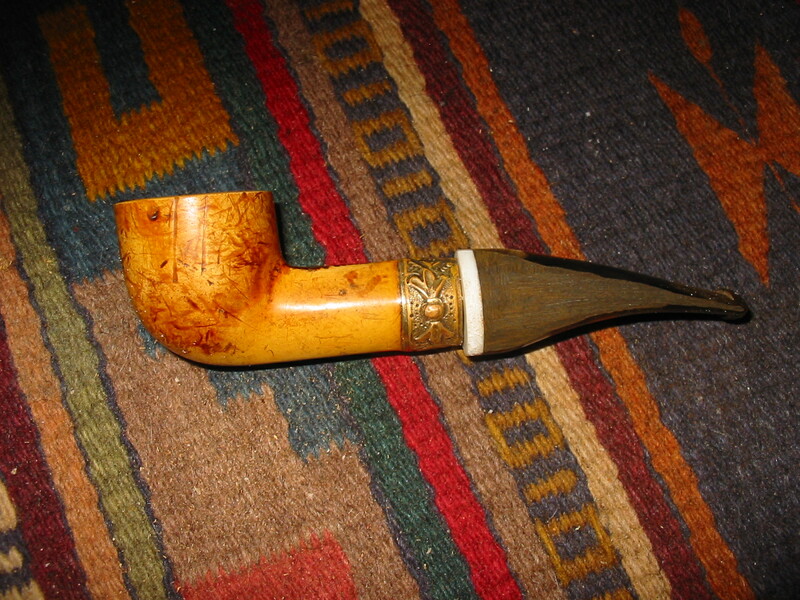 I sanded the stem with a medium grit sponge backed sanding pad. 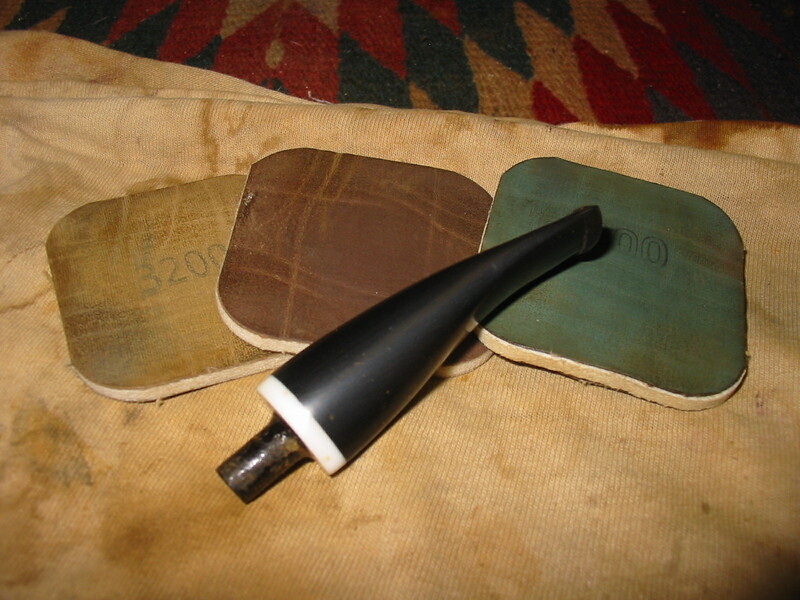 It helped to remove the scratches left behind by the 200 grit sandpaper. Then I sanded the stem with micromesh sanding pads from 1500-12,000 grit to polish and shine the vulcanite and the patched areas. The white Lucite band that was a part of the stem began to take on a shine as well in the process. The next nine photos capture what took about an hour to achieve in the sanding process. 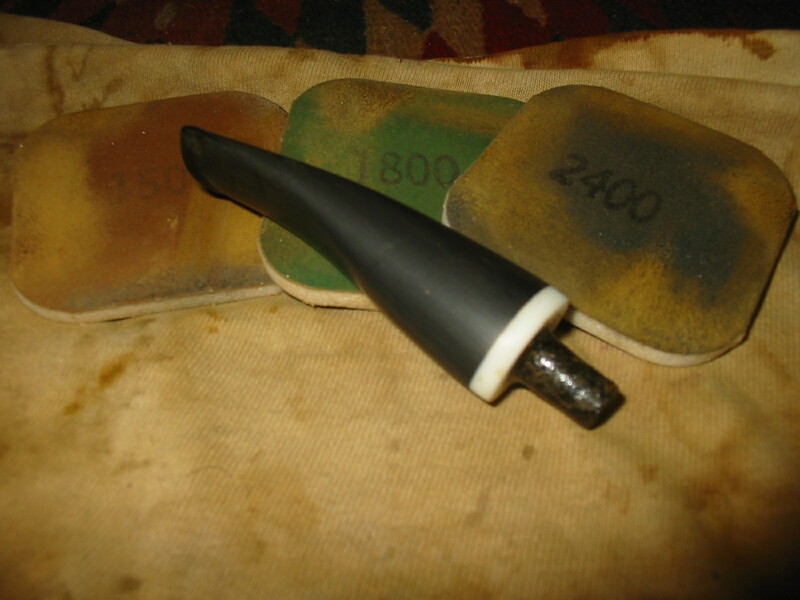 I wet sanded with the 1500, 1800 and 2400 grit sanding pads and dry sanded with the remaining grits of micromesh. 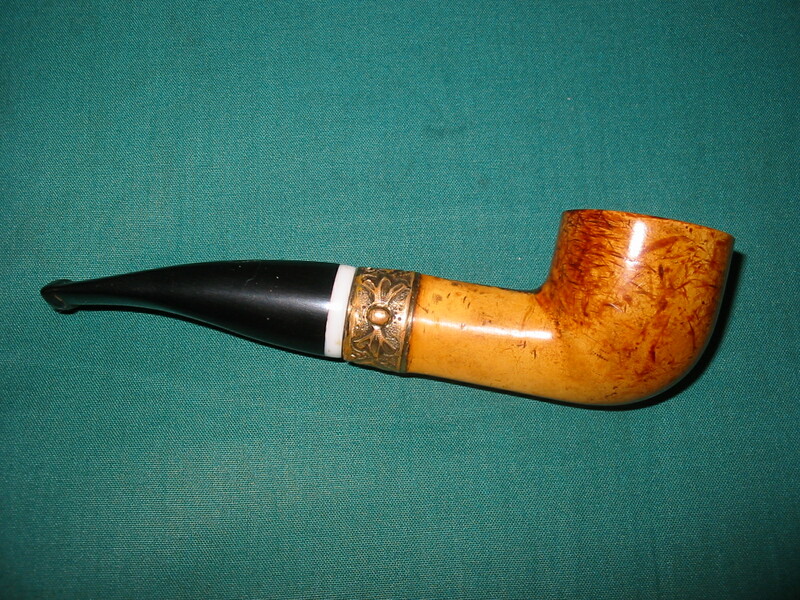 I buffed the stem with White Diamond and a blue plastic polishing compound to bring out the final shine on the stem. 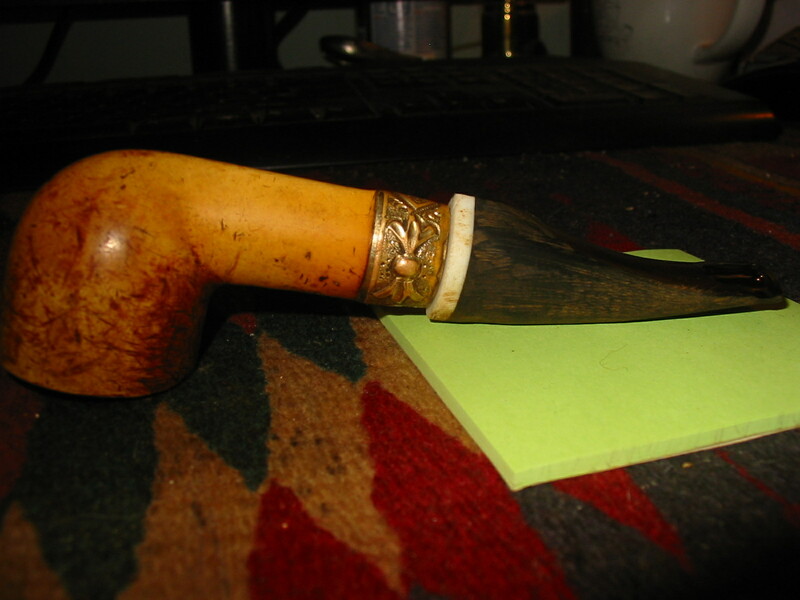 I hand waxed the meerschaum with beeswax and hand buffed it with a shoe brush. 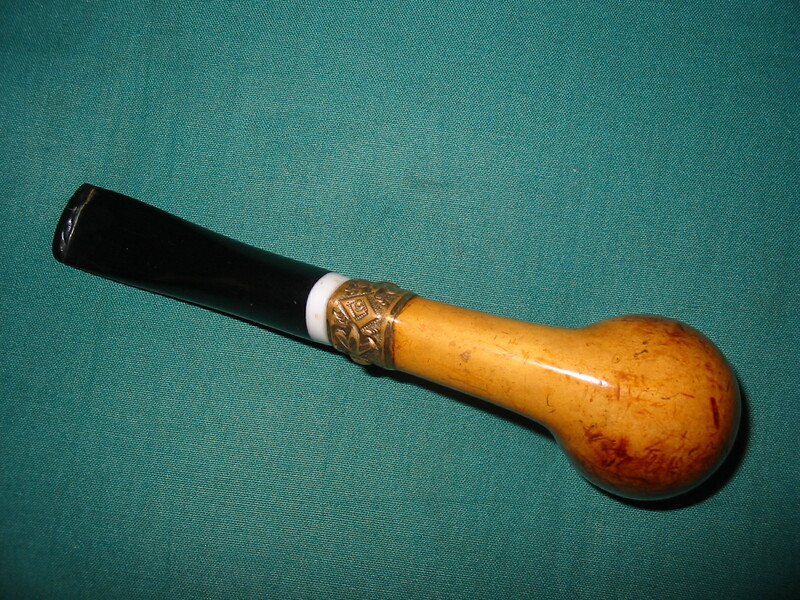 The next four photos show the finished pipe with the new stem. 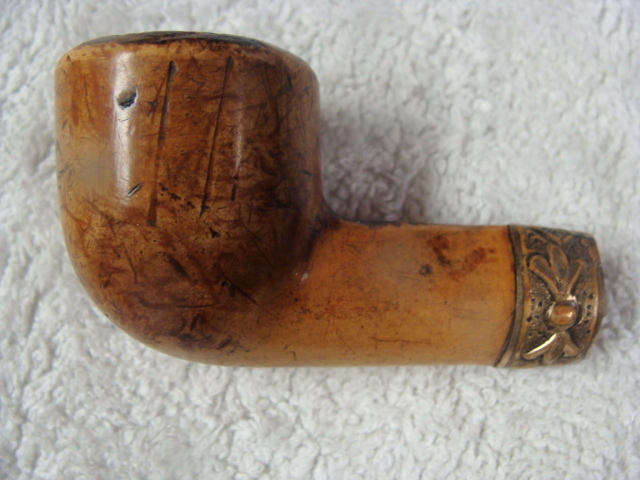 I like the marks and scratches in the meer as they seem to speak of the long journey the pipe took to get to me. The white Lucite band on the stem fits nicely in my thinking against the gold of the filigree band. The slight bend it the stem works nicely for me. 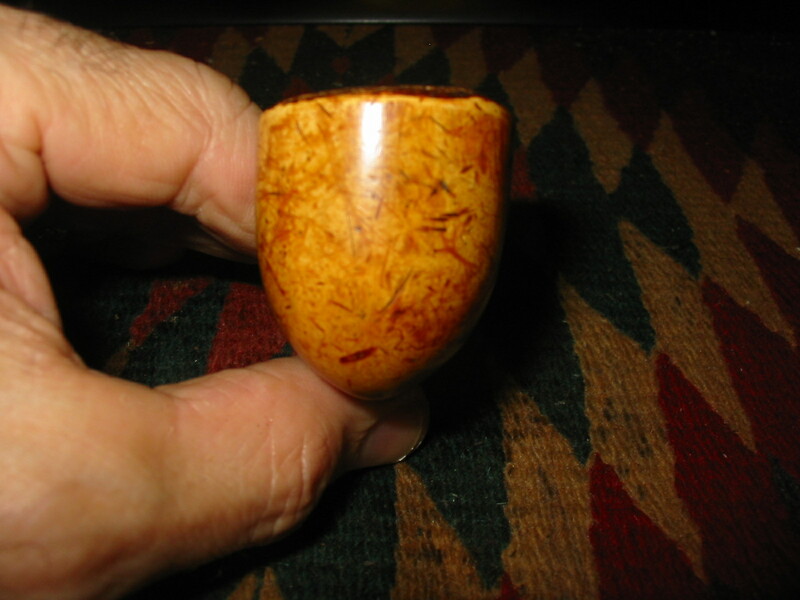 From the last two photos you can see the oval shape of the stem now that it is completed. It has come a long way from the round stem I received as a gift from Ron. 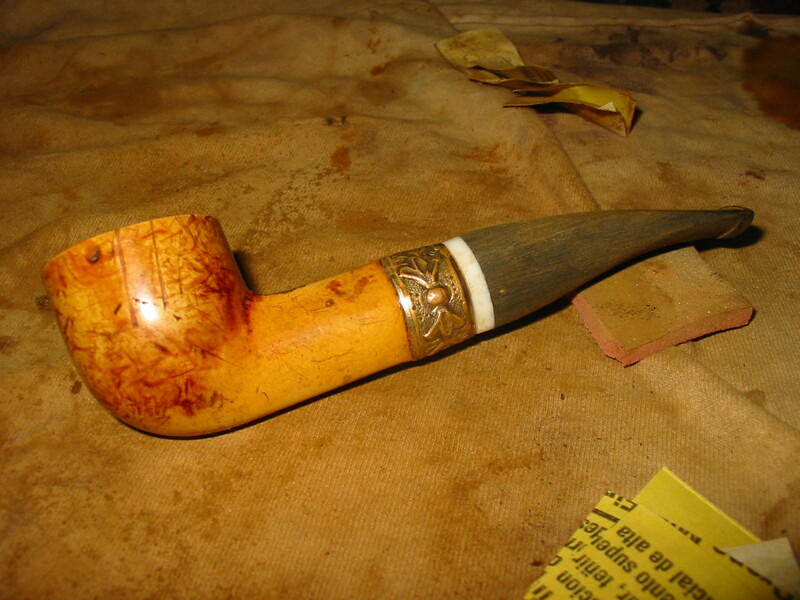 This entry was posted in Pipe Refurbishing Essays and tagged Bowl - finishing, Bowl - refinishing, bowl topping, buffing, drilling out a broken tenon in a meerschaum pipe, finishing, fitting a stem, micromesh sanding pads, pipe refurbishing, pipe restemming, polishing, polishing a stem, refinishing, refurbishing, removing oxidation, removing tooth marks, repairing bite marks, repairing tooth marks, restemming a meerschaum pipe, restemming a pipe, sanding, sanding a stem, shaping a stem, Stem repairs, stem work, super glue, topping a bowl, Topping a meerschaum pipe, turning a tenon, vulcanite, waxing a stem on September 21, 2013 by rebornpipes.